I first became aware of Verdy when I first started to learn ballet as an adult. It was about nine years ago. I bought the DVD “Violette et Mister B,” in which I saw how she coached Isabelle Guerin in “Dances at a Gathering,” among others. Her energy and humor, and her fervor in passing on the Balanchine style in the most faithful manner really impressed me. And here is a video of her talking about Balanchine, taped at her home in 2005. The opening and closing shots in the video come from the film “The Poor Little Ballerina,” shot in 1950 when Verdy was only 16 years old! Look at her technique and acting skill, both of which were quite marvelous given her tender age. May this beautiful and strong flower of the ballet world continue to bloom wherever she is now. George Balanchine and his ballerinas in “Jewels.” Verdy was the one standing directly behind him, in the Emerald costume. 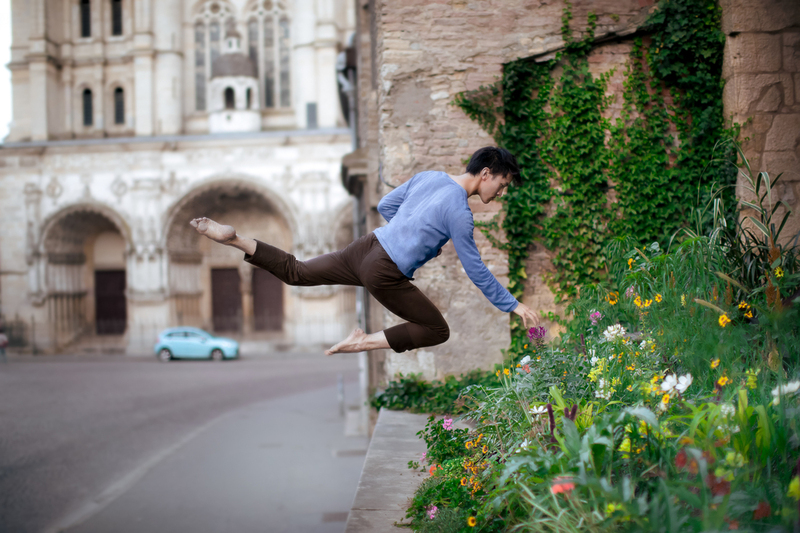 Male ballet dancers in Asia are a rare species. Not that they don’t exist. But generally speaking, parents do not encourage their sons to pursue the path of becoming a professional dancer because dancing is still very much considered a feminine activity and thus a dancing boy would be seen as a “sissy.” In addition, in Chinese societies, especially in places like Hong Kong and Taiwan, where there is scanty government funding for the arts, dance is not regarded as a prestigious profession, as being a dancer does not equate a big salary and a “stable” future. Against these odds, there are a few young male dancers who have followed a non-traditional path and carved a niche for themselves. By defying the skepticism around them, these young men have become a source of inspiration for many aspiring dancers. When you look at Jou’s “selfies,” it is hard to tell that he is not a professional dancer. What surprised me the most is that he actually did not start to take ballet lessons until he was 18. He studied business in university and started working in sales. His adventurous spirit brought him from the United States to Paris, France and later to Berlin, Germany, where he is now working with photography. His passion of dance+photography has taken him around the world doing crazy jumps amid wide-eyed and head-scratching crowds. He is a perfect example of someone who lives outside the traditional box—a box that is perpetuated among Chinese families. He is a true inspiration of creativity for us Chinese people! Another young Taiwanese man, Meng Ting (孟霆）, grew up in his mother’s ballet studio and eventually pursued ballet studies at Taipei National University of the Arts. But after graduation, he has chosen to join the army’s Honor Guard. The Taiwanese media published a report on this (http://bit.ly/1eCjDJG). Why has he chosen this career path? “The main consideration was the practical side,” he answered, hinting at the uncertainties of pursuing the ballet profession in Taiwan. He said he did not audition for a ballet company after graduation. But he still practices and performs in his mother’s studio’s yearly school performance, and finds tremendous satisfaction in that. In the video posted by Taiwan’s Security Department as a recruitment ad (above), Meng said that he has chosen to work in the Honor Guard as there is a chance for him to perform on stage and he finds a parallel between the work there and ballet dancing. Both have very specific and detailed demands for each movement and require a strict discipline. At the same time, there is a constant need to come up with new choreography for the Honor Guard, so it is just as challenging as dancing ballet. The “selling point” used by the Taiwanese military is that a man who can execute graceful movements can also be suitable for work in the military—a perfect harmony between the soft and the hard sides of masculinity. Meng told me that the job suits him because he can find the perfect balance between financial stability and an outlet to make use of his dancing talents, applying the spirit of ballet in his military work. Like so many Chinese mothers out there, Kelvin’s moother has never really supported his choice of becoming a dancer. But Kelvin dances on, in the hope that one day he will earn her support through his success. Among his numerous achievements so far is winning the third prize in the Classical Pas de Deux category at The American Dance Competition in 2013. Watch him dance in the YouTube links below.